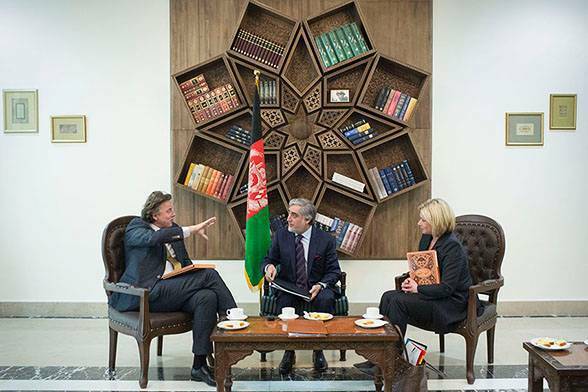 Foreign minister Bert Koenders and defence minister Jeanine Hennis-Plasschaert visited the Afghan capital Kabul on Tuesday. There they met with members of the Afghan government, including President Ashraf Ghani Ahmadzai, Chief Executive Officer Abdullah Abdullah, foreign minister Salahuddin Rabbani, interior minister Nur ul-Haq Ulumi and defence minister Enayatullah Nazari. They also spoke with members of the High Peace Council, the body in charge of reconciliation with the Taliban. In Kabul the ministers participated in an in-depth discussion of the progress of the Afghan peace negotiations and the creation of a unity government. Mr Koenders believes it is imperative for the Afghan government to address its priorities and institute reforms. ‘I support President Ghani’s initiative of engaging in a phased dialogue with the Taliban, reaching out to neighbouring countries like Pakistan, combating corruption, enhancing the rule of law, implementing economic reforms, and getting more women involved in the political process,’ he said. All parties must feel that they have a part in the peace process, Mr Koenders affirmed, noting that this was ‘the only way to achieve sustainable and inclusive peace and stability in Afghanistan and the wider region’. The ministers noted that the violence unleashed by ISIS is also a threat to Afghanistan. ‘Together with the Afghan people, we must do everything possible to prevent this country from becoming a haven for terrorists and jihadists,’ they remarked. ‘After years of war and unrest, Afghans long to live in peace and security.’ This is why the Netherlands is participating in Operation Resolute Support with NATO and the Afghan army. At present, 100 Dutch military personnel are stationed in northern Afghanistan. The ministers paid a visit to their base in Mazar-e Sharif on Monday. ‘They are making a genuine contribution to a secure Afghanistan,’ said Mr Koenders and Ms Hennis-Plasschaert, who also took the opportunity to praise the Dutch team for their work. Ms Hennis-Plasschaert is also pleased with the progress Afghan security forces are making in shouldering responsibility for Afghanistan’s security. ‘We are placing great demands on the Afghan army and police force. In the past two years, the number of international military personnel in Afghanistan has gone from 50,000 to 12,000. The Netherlands, NATO and other international partners continue to monitor the security situation in Afghanistan closely. This is vital to informing the decisions we have to make this year on continuing Resolute Support,’ she said, referring to the development of the ‘hub-and-spoke’ model spearheaded by NATO.